May is upon us and it has been quite some time since we have shared an update about SoCal Regionals. Before we dive into details, we would like to catch everyone up to speed on what has been going on with the event and moving forward. March 24: We announced construction delays at our initial SCR venue which forced us to pursue new venues with the possibility of postponing SCR to a later date. This was heartbreaking to go through since we had such a great event planned at a venue that caters specifically to events like ours and something new for the scene. After breaking the news to everyone, we were in a state of emergency setting up appointments with venues throughout Southern California. March 26: An update to the venue search was provided with new tentative dates for SCR. Appointments were made with just about every major hotel and event center with at least 10,000 square feet. Why 10,000 square feet? SCR had over 800 registered players and a full house of spectators last year. The UCI Student Center, SCR’s previous home, had approximately 11,000 square feet so options were becoming limited as we continued our search. The next challenge was finding a venue that can accommodate four full days for SCR; one for set up, three for the event and teardown. Most were only able to provide one or two days. With things not looking very promising, we inevitably had to look into a new target date, which was another huge hurdle considering the amount of major fighting game events in May and June. We eventually targeted June 5-7 as the new tentative SCR dates since it had the least amount of conflict with other events within the region. March 30: We broke news of officially postponing the May 1-3 dates and planned for June 5-7 as the new target dates. We were confident we could find an available venue but quickly learned that we were competing with wedding and summer events season in SoCal which took many weekends in June. Also, the prices for venues in our region hike over $10,000 a day including set up day. Room sales also have to be substantial enough to consider a discount for ballrooms which we unfortunately do not reach due to many local players living near the Orange County / Los Angeles area. We were running out of options fast and had to look at unique venues we could host SCR besides traditional ballrooms. April 7: A bit of good news was announced as we have found a venue that can accommodate availability, space, and other needs necessary to host SCR; The Hangar at The OC Fair and Events Center. This unique venue has hosted many fantastic concerts and other public showcases so we were fortunate to find it within a reasonable time. However, with such a popular venue comes several surprises. We were informed that there is a huge food festival happening on the same dates we were targeting, June 5-7. When we say huge, we are talking about 50,000 in expected attendance. This presented possible logistical issues as we were unaware if both parties would be stepping on each other’s respective event turf. We reached out to the food festival organizers and scheduled multiple meetings to discuss collaboration efforts. After we came to an agreement, we were absolutely thrilled about pursuing The Hangar as the new home of SCR. At this point, we did not want to make any more updates until details were solidified. Finding a new venue comes with a lot of unknowns and new planning for SCR. The fairgrounds informed us that the contracting process takes over a month to have everything approved. In addition, the venue has convention style contracting which involves various third party vendors to help design events from the ground up. We had to make rigorous plans to align all parties; from electrical, internet, tables & chairs, staging, lighting, and much more. SCR needed to be redesigned from the ground up, again, which included floor plans, scheduling, resourcing, and anything else we could think of. As a result of extra planning mechanisms and more parties being involved, we could not move forward until every single piece was finalized for contract approval. May was approaching fast and we had to make a decision of sticking with the current venue or go back to the drawing board. Today: We are catching everyone up to speed and sharing the next steps in bringing SoCal Regionals to the fans. We hope you enjoy what we have planned! Tournament season is well underway with many exciting events happening around the world. SCR is one of a few international events fans attend to enjoy exciting competition and to celebrate fighting games. The players deserve an event thoroughly planned out with guests having ample time to make travel arrangements and make their mark in tournament history. After many conversations with the Level Up team, we have decided to extend SoCal Regionals to two extra tournaments this year which will lead to the main SCR 2015 event in Q4. Introducing, SoCal Regionals: Prelude I & II. 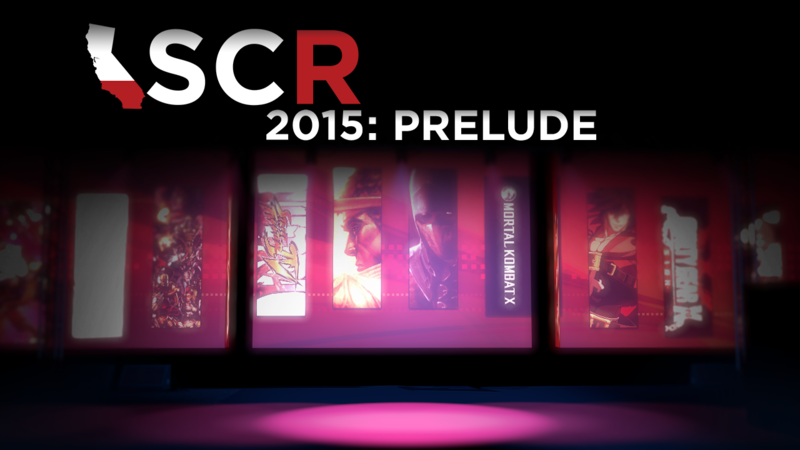 SCR: Prelude I will feature four of the hottest titles in our region including Ultra Street Fighter IV, Mortal Kombat X, Guilty Gear Xrd, and Ultimate Marvel vs Capcom 3. Prelude will serve as a much needed training initiative to level up locals and nearby regions for upcoming major events this summer. We are also featuring the first Prelude event this June 6, 2015 at our previous SCR home, the UCI Student Center! Collaborating once again with our good friends from the Fighting Gamers@UCI, we are bringing excitement and a taste of what’s to come for the SCR main event. Prelude II will have a tentative August date and the game lineup may change depending on community feedback. Every game will be showcased on our Twitch channels, leveluplive and leveluplive2, and there will be a cap of 128 per tournament game. Online registration for Prelude events will open very soon on our socalregionals.com site. Gearing up for the main event, SoCal Regionals is now targeted for October 9-11, 2015 and we are also looking into the Ontario Convention Center as the new home of SCR! We had a site visit on April 25 and was impressed with venue accommodations, contracting process, and how close the airport and hotels are from the convention. At this time, we are working on the new floor plan and other immediate action items to move forward with the contract and open registration soon after. Since the event is targeted for October, we have more time to plan, properly promote, and showcase the best possible fighting game event the community deserves. We truly appreciate your continued support throughout every SCR update and look forward to seeing everybody at the main event! For guests that have cancelled their flight for the May 1-3 dates and had fees incurred, we’re thinking about you too! Please feel free to contact us at admin@levelup-series.com with proof of travel documentation and we will work something out for the inconvenience.